The Swaminarayan Sampradaya is a sect of Hinduism, which has been established for approximately two centuries, the founder of this sect was Lord Shree Swaminarayan. In the mid-twentieth century many satsangis had moved to East Africa, they had regular contact with organisations in India. Sadhus and spiritual leaders often visited them, so the religious momentum was continuing. In the 1960s, some of the satsangis immigrated to Great Britain. Because they were religiously conscious and followed the principles of Lord Shree Swaminarayan via the Shikshapatri they wanted to get together for prayers and to celebrate religious festivals. In the beginning they used to meet up at each other's houses and for religious celebrations communal halls were hired. The number of satsangis increased and it became more difficult to accommodate them. We asked the advice of the late Reverend Mahant Swami Dharmajivandasji. At the time, he was the head priest at Shree Swaminarayan Temple Bhuj. He said in order to keep up the religious practice to guide the younger generation to lead a healthy and spiritually peaceful life, the satsangis in London should look for a centrally located place of worship. In 1975 a disused church on Willesden Lane was bought and renovated. It was officially opened in late 1975 to the public. His Holiness Shree Tejendraprasadji Maharaj and sadhus from India paid frequent visits to Willesden Temple. On the auspicious day of Sharad Purnima on 11th October 1975, Archarya Maharajshree personally installed the murtis of Lord Shree Swaminarayan, Shree NarNarayan Dev, Shree RadhaKrishna, Shree Hanumanji, Shree Ganeshji and gave his eternal blessings to the Temple. As time went on even the large church building could not accommodate the increasing numbers of satsangis. New activities had also been introduced by this time, such as Gujarati classes, a library, and a picture framing service as well as other youth activities. An adjoining building was bought thinking that it would solve the problem, but even so this could not meet the needs of the satsangis. In 1986 a proposal was put forward to demolish the two existing buildings and in its place build a three temple storey complex, which would combine the traditional Hindu Temple architecture and British designs. It would include a car park in the basement, prayer halls on the ground floor and a social and community hall and rooms for Gujarati classes on the first floor. Also there would be cooking, washing and storage facilities, religious books, audio/video cassette library, picture framing services and other activities. The proposal was whole heartedly and unanimously accepted. With the blessing of learned sadhus from Bhuj Temple, donations started pouring in. satsangis took this as an opportunity to make financial contributions towards this hol y cause and within a day a sum of half a million pounds was pledged. The flow of contributions has not stopped to thisday. The ceremonial stone was laid on Sunday 12th October 1986 in the presence of holy sadhus from Bhuj Temple, the Mayor of Brent and other dignitaries. The demolition of the two buildings was started in November 1986 and the construction of the new Temple building soon followed. The building of the Temple was greatly accelerated due the effort and time put in by our satsangi volunteers, who worked on weekends, late evening and public holidays. A year and a half later the project was completed. The official opening of the complex was on Friday 29th July 1988 in the presence of H. H. Archarya Maharajshree and his family, sadhus and Swaminarayan satsangis from all over the world. 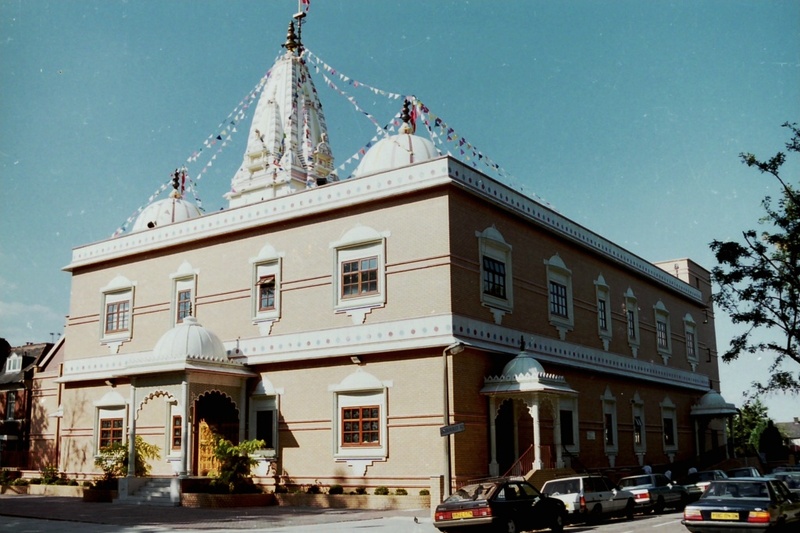 Since 1988, Willesden temple has produced material aimed more towards the western orientation. Youngsters these days are more likely to read and understand text in English, therefore in 1992 we published a highly successful version of the Shikshapatri translated into English, so that the youth of today can follow the basic rules that Lord Shree Swaminarayan intended on us to follow. As the public demand from Europe, America and India grew, 1993 saw the release of Kirtan Dhara Volume 2. They had also been taken from the Kirtnavali, again allowing all generations of satsangis to experience the soul, spirit and essence of our religion and culture.